PLEASED: Geelong Superintendent Craig Gillard. Geelong crime has dropped 11 per cent in a year despite a 900 per cent spike in blackmail. 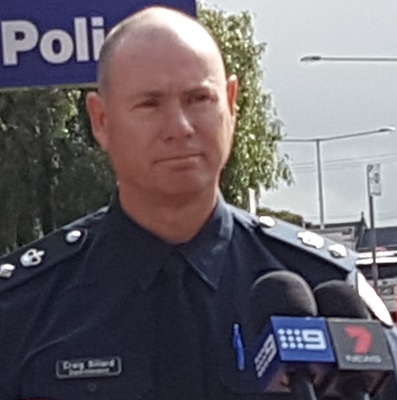 Police recorded 20,849 offences in Geelong during 2018, down nine per cent on 22,962 in 2017, according to data Crime Statistics Agency released yesterday. Geelong Superintendent Craig Gillard welcomed the reduction, which equalled 11 per cent after allowing for population growth. “I think it’s a really good set of figures for Geelong,” he said. Supt Gillard said the jailing of several prominent career criminals last year had “absolutely” contributed to the reduction. He promised to continue “targeting both the people and areas known to us” to “keep them on the straight and narrow”. “I’ve been here two and a half years now and that’s been our focus the whole time,” he said. But a doubling in abductions and a 900 per cent spike in blackmail marred the otherwise positive figures. Blackmail offences rose from one to nine but Supt Gillard said this likely resulted from a single incident. The majority of abductions were related to drug deals or family violence, he said. Geelong also recorded minor increases in assault, stalking, disorderly conduct and weapons offences. Arson, vandalism and theft were all down in Geelong and burglary dropped 28 per cent. “In burglary we’ve had one of the biggest drops in the state and it’s the lowest it’s been in ten years,” Supt Gillard said.